Physicists have identified 12 building blocks that are the fundamental constituents of matter. Our everyday world is made of just three of these building blocks: the up quark, the down quark and the electron. This set of particles is all that's needed to make protons and neutrons and to form atoms and molecules. The electron neutrino, observed in the decay of other particles, completes the first set of four building blocks. 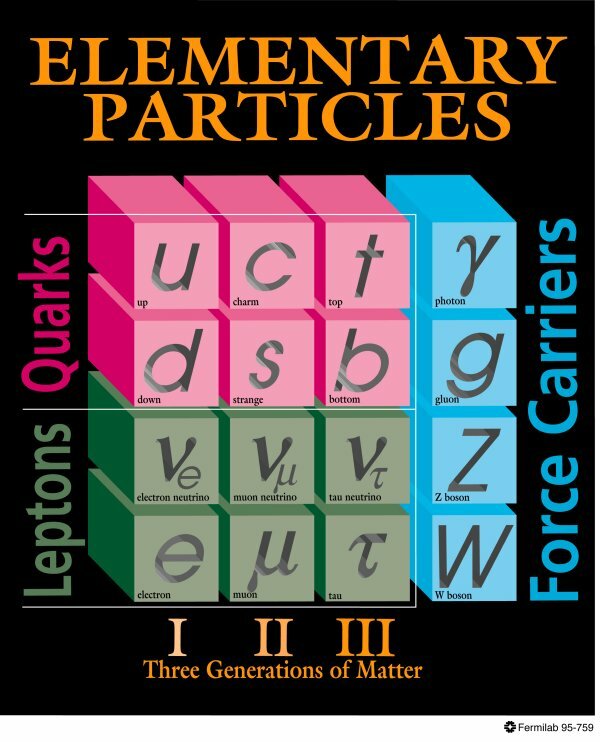 The building blocks of matter: six quarks and six leptons. For some reason nature has elected to replicate this first generation of quarks and leptons to produce a total of six quarks and six leptons, with increasing mass. Like all quarks, the sixth quark, named top, is much smaller than a proton (in fact, no one knows how small quarks are), but the top is as heavy as a gold atom! Although there are reasons to believe that there are no more sets of quarks and leptons, theorists speculate that there may be other types of building blocks, which may partly account for the dark matter implied by astrophysical observations. This poorly understood matter exerts gravitational forces and manipulates galaxies. It will take earth-based accelerator experiments to identify its fabric. Physicists expect that the gravitational force may also be associated with a boson particle. Named the graviton, this hypothetical boson is extremely hard to observe since, at the subatomic level, the gravitational force is many orders of magnitude weaker than the other three elementary forces. Table of particle discoveries: who, when, where? Less than 10 years ago, physicists at CERN (1995) and Fermilab (1996) created the first anti-atoms. To learn more about the properties of the "Mirror World," they carefully added a positron (the antiparticle of an electron) to an antiproton. The result: antihydrogen. The Standard Model explains the complex interplay between force carriers and building blocks. Physicists call the theoretical framework that describes the interactions between elementary building blocks (quarks and leptons) and the force carriers (bosons) the Standard Model. Gravity is not yet part of this framework, and a central question of 21st century particle physics is the search for a quantum formulation of gravity that could be included in the Standard Model. Everything about neutrinos, electrons and light.